Mahabharata Episode 14: The Burning of the Khandava Forest. Agni requests Arjuna and Krishna to help him burn down the Khandava forest for the flesh and fat of the animals in the forest would cure him of his loss of appetite. Arjuna and Krishna helps him, and a great fire rages through the forest killing all creatures who lived there. Krishna and Arjuna spared Maya Asura’s life, and to express his gratitude Maya builds a magnificent assembly hall for the Pandavas. 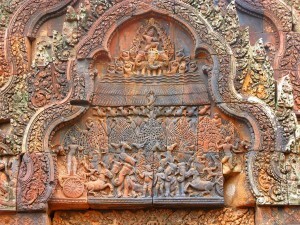 Narada visits Indraprastha and advises Yudhistira to perform the Rajasuya Fire ceremony. But Krishna warns Yudishtira that he must kill the vicious king Jarasandha if he would like to succeed in his bid to become the emperor. 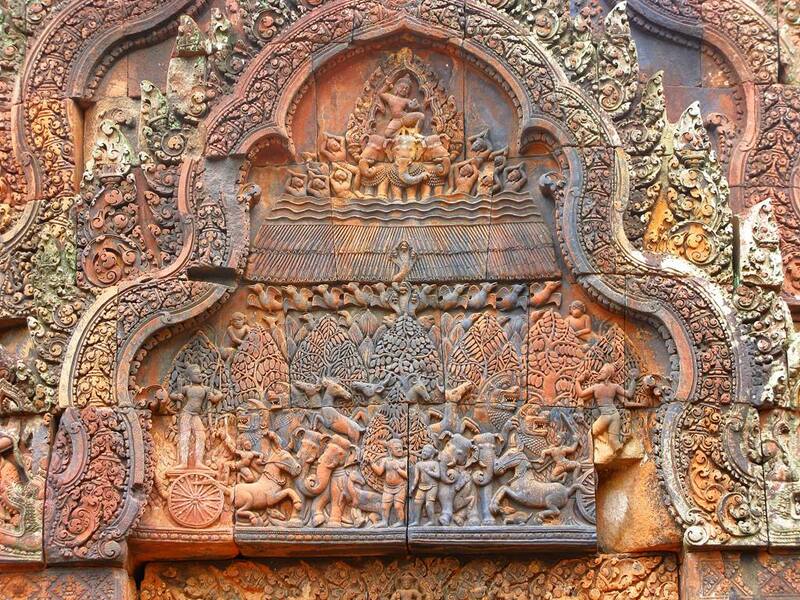 The image is a sculpture from Banteay Srei temple, in Cambodia. Arjuna and Krishna are seen on chariots on either side; Indra is atop his elephant Airavata in the sky; Numerous arrows in mid-air counter the downpour of rain; Different birds and animals are seen scattering; Takshaka’s wife and Aswasena are seen rising in the sky. Image and description taken from the jayarama.wordpress.com blog.